The search engine has the power to help but also hurt any business with an online presence. Meet one entrepreneur who figured out how to thrive in this strange new world. 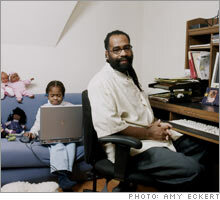 (FSB Magazine) -- Kamau Austin is obliged to work at home so he can take care of his 7-year-old autistic daughter, Elon. In 2001, Austin, 50, launched an online consulting business out of his house in Montclair, N.J. Today he runs 28 websites for minority entrepreneurs on topics ranging from online marketing (searchengineplan.com) to Internet strategies (einfonews.com). Two years ago Austin signed up for Google's AdSense program. The software places ads that complement each of his sites, and shares a portion of the ad revenues with him. AdSense has allowed thousands of small online entrepreneurs such as Austin to create an income stream out of content that formerly had no commercial value. "A tremendous ecosystem has built up around Google," says Michael Gartenberg, an analyst with Jupiter Research. Thanks to AdSense, 14 of Austin's 28 sites are peppered with ads from major companies such as eBay and Wells Fargo. He estimates that AdSense generates about 15% of his six-figure annual income. And visitors who find Austin's sites via free Google searches may wind up hiring him as a consultant. "One way or another, Google generates a large portion of my income," Austin says.